- Breakfast is my favorite meal of the day, and I drink at least 2 cups (500ml) of cold milk daily. I hate hot milk; it has to be mixed with coffee or chocolate for me to be able to drink it. - I have a small collection of cows’ figurines around the house. What once started as a joke between my husband and I has now expended to salt and pepper shakers, kitchen apron, cell phone holder…etc. This cute cow on the photo is my latest baby, given to me by my beloved sister. Thank you very much, Y! - I speak Arabic, French and English, and understand some Spanish. My husband is way better than me in Spanish and he likes to show it off from time to time just to upset me. Which always works! - I don’t like Hummus. Although I love Chickpeas. Did you know that Hummus means Chickpea in Arabic? I am sure you all know it! - I went to law school for one year before finding out that it was boring, corrupted and exhausting. I studied French Literature after that. I enjoyed it very much and miss sometimes my college years. - I get scared easily. Very, very easily. My husband takes advantage of it a lot, and I am afraid I might have a heart attack one of those days. Not that long ago, thinking I’ve heard some noise in the kitchen, I woke up my husband and sent him to go see if there was something, or most specifically somebody downstairs. I felt really bad about waking him up and decided to go with him (Actually, I was left alone in the bedroom and I was scared that somebody might jump out of the closet. I have a vivid imagination). I followed him, carrying with me a big, heavy…candle that I have on my chest of drawers. He looked at me: “what do you think you’re doing with this candle?” “Well…it was the first thing I saw, and I thought this might protect us if there was somebody downstairs!” There was nobody downstairs that day. But every time I hear a noise in our house, he jokes and reminds me not to forget to take my candle with me. - I love cheese. Especially Goat cheese, Roquefort, Camembert, Brie, Feta, Gruyere, Ricotta and Comté. Today’s recipe is very, very easy to make. The filling can be prepared a day, or even two days ahead and assembled the day you want to serve it. 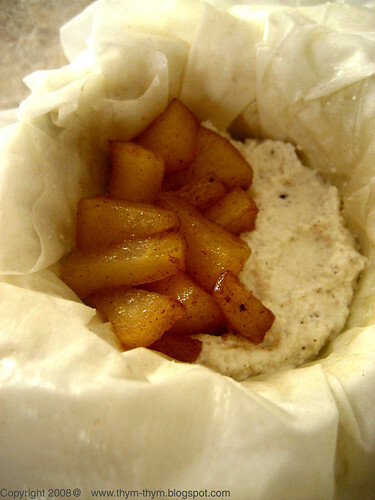 The golden phyllo dough gives this distinguish crunch to the dessert, and the creamy ricotta, infused with honey and cinnamon, adds a bewitching silkiness to the sautéed apples. I used Pink Lady Apples, because I love how both sweet and tangy they are, and how they hold their shape after cooking them. Avoid using ceramic or silicon muffin pans, as they retain moisture and you will end up with a mushy bottom. - 8 phyllo sheets, cut in half. - 3 tbsp melted butter. Using a whisk, mix the ricotta with honey, ¼ tsp ground cinnamon and the egg, until well combined. Set aside. On a medium flame, Heat a teaspoon of butter in a pan, and sauté the diced apples with the remaining cinnamon and the sugar until lightly golden brown on the edges, about 5 minutes. Brush the muffin pan with a little bit of melted butter. Brush the phyllo sheets with some of the remaining butter and line each muffin cup with four phyllo sheets. 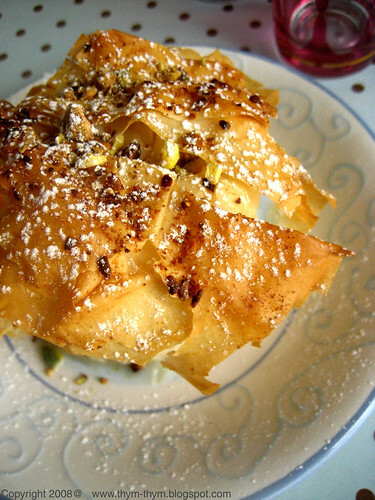 Put inside each phyllo “nest” a layer of ricotta, a layer of apples and top with a little of pistachios. Fold the phyllo sheets over the filling as you would fold a bag. Continue with the remaining phyllo cups. Brush each phyllo parcel with the remaining melted butter and bake at 350F for 20 minutes, or until the top is golden brown. Let it cool for 5 minutes inside the muffin pan and invert gently without breaking the top of the parcels. serve warm or cold, topped with a little bit of ground pistachios and icing sugar. A l’aide d’un fouet, mélanger la ricotta avec le miel, ¼ c.c de canelle et l’oeuf entier. Mettre de côté. Sur un feu moyen, faites fondre une c.c de beurre et faites sauter les pommes avec le reste de cannelle et le sucre, juqu’à ce qu’elle deviennent légerement dorées sur les bords, envirom 5 minutes. Beurrer votre moule a muffins et vos feuilles de filo avec le beurre fondu. Laisser-en un peu pour la fin. Garnir chaque portion du moule avec 4 feuilles de filo et les remplir d’une couche de ricotta, puis une couche de pommes, et enfin un peu de pistaches en poudre. Fermer la pate à fillo sur la farce comme si vous fermez un sachet. Beurre la surface du beurre fondu restant. Faites cuire à 160C pendant 20 minutes. Laisser reffroidir 5 minutes dans le moule, puis démouler en faisant attention à ne pas abimer la surface. Servir tiède ou à temperature ambiante, saupoudré de pistaches en poudre et de sucre glace. Oh I really like the sound of this. Simple yet so full of flavor! I wish I spoke more languages! That dessert looks delicious! 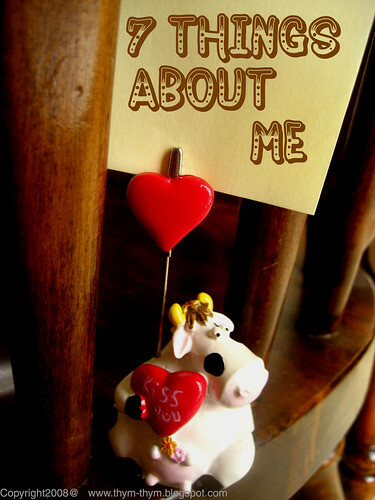 Great to learn a bit more about you! I too wish I spoke more languages! Beautiful dessert! I totally agree with your love of cheese! Je suis ravie d’en savoir un peu plus sur toi. Je t’envie aussi d’être polyglotte. Quant à tes recettes, elles sont toujours aussi sublimes tout comme tes photos. Un vrai régal pour les papilles et les pupilles. PS : ta tarte tatin poire et mangue a été très appréciée. I love desserts that are easy to make but look incredibly elegant. I'm bookmarking this one! Trop fort le coup de la bougie. Comme murielle a dit, trop fort le coup de la bougie! Thank you for the tag! And your recipe sounds so simple and lovely. 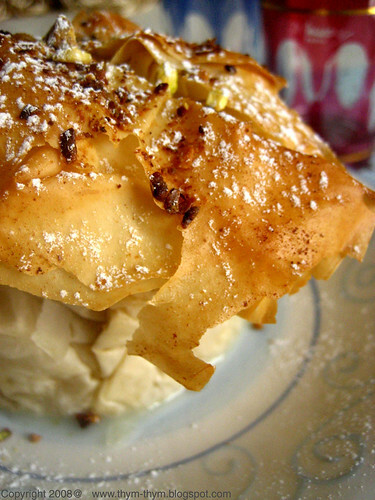 Ricotta is so versatile and using them with phyllo is a great idea. After making baklava for the first time, I am now a huge love of phyllo dough. This looks like an amazing recipe to try with it. - Meeta, thank you very much! - Brilynn, thanks! And I wish I could speak more. - Helene, thanks you! Who can resist the cheese platter at the end of the meal? Not me! - Scherazade, je suis tres contente d'apprende que me tarte fut un succes :) Merci beaucoup, ma chere amie! - Murielle, ca me fait rire a chauqe fois aussi. Pour ce qui est de l'auto defense, je suis la championne! - Christine, hahahah! the intruder would have been amuzed too! The incident of the candle is just one of the many adventures I had...I'll spare you the others. - Claude-Olivier, et tu es toujours aussi gentil! Merci beaucoup! - Marion, it's funny because all my cows are black and white, too. Ohhh! Don't laugh! It was a scary moment for me...followed by an uncontrollable laugh! J'ai de ces idees parfois!! !Thank God, there were nobody this day. Otherwise he would have been badly hurt by my candle! Hahhaahha! - Cheryl, I love working with phyllo dough, too! In both savory and sweet dishes. Your Baklava must have been so delicious! that looks simple and wonderful. and any dessert made with cheese is instantly accepted into my dessert pantheon. On va finir par tout connaitre!! Tu as commenc� par "tes 7 p�ch�s capitaux..." et le reste?... ton dessert parait succulent et frais ,ma pauvre Warda la liste s'allonge ...quoi que!! mais il y a des exceptions .Biz . Phyllo always makes a masterpiece and this is nonetheless of a masterpiece. Thanks for sharing. - Michelle, thanks a lot1 Glad you like it. - Mima, je sais ou m'arreter. Et je pense qu'a toi on peut rien te cacher ;) Ca ne me derange pas de voir que la liste s'allonge! Juste, pense a ramener un tablier pour toi aussi!! hahahha!!! - Noble Pig, thank you veru much! That is so sweet! Thank you Maryam. I am sure you must have tons of sweet treats in Marrakesh. By the way, I love your blog and your adventures building a guest house in Morocco. Wish you all the best! I don't think I have seen a desert more elegant than this..Wow so light and fluffy - I am stunned. Hi - thanks for the phyllo recipe with the cheese. My kids enjoyed it and surprisingly my husband did too. I enjoyed reading your blog and wish youb best.